[S80] Ancestry - Family Tree, hayleychaffer. [S250] General Register Office for Scotland Indexes "certificate - parents married 23 Dec 1893 at Long Livingstone." [S5] Registry of Births Deaths and Marriages Death Index Victoria 1921-1985 "#D22219 age 68 [par Charles EVERY & Lilian STEWART]." [S35] Probate Records, PROV (Public Records Office Victoria), VPRS 28/P4, unit 3244; VPRS 7591/P3, unit 549. [S16] Newspaper - The Age 31 May 1941, p2. Death-Notice* 4 Jul 1949 KERR, - On July 2, at his residence, Trenant. 32 Belmont avenue, Kew, William Warren, loved husband of the late Janie Buchanan, loving father of Violet (Mrs. V. P. Odgers), Lindsay (Croydon), and William (deceased). In his 84th year. KERR. - The Funeral of the late Mr. WILLIAM WARREN KERR will leave his residence, Trenant, 32 Belmont avenue, Kew, THIS DAY, at the conclusion of a private service commencing at 3.15 p.m. The Funeral will arrive at the Box Hill Cemetery at 3.45 p.m.
A. W. PADBURY & CO. PTY. LTD. WA8131. KERR. - Austral Temple Lodge, No. 110, A., F., and A. Masons.-Officers and Brethren of the above Lodge are respectfully informed that the Funeral of their late Most Wor. Bro. W. WARREN KERR, P.G.M.. will arrive at the Box Hill Cemetery THIS DAY at 3.45 p.m.
SALE of ORCHARD and RESIDENCE SITES, UPPER BEACONSFIELD, Split Rock Road, 300 Yards from P.O. GEORGE G. HENDERSON PTY. LTD., under instructions from W. Warren Kerr, Esq., will SELL by PUBLIC AUCTION, as above. 30 ACRES, UNIMPROVED LAND, Adjoining above. These blocks occupy the most choice positions in this beautiful and popular district, commanding magnificent vieivs over the surrounding country. The 10-acre block has a frontage of 648ft. to the main road, which could with advantage be cut off and sold as residence allotments, being within 300 yards of the post-office, store, Salisbury House, and local hall, and the 30 acres has a quantity of valuable timber upon it, and commands a most extensive outlook. Terms-½ cash, balance 1, 2, and 3 years; Interest 6 per cent. N.B.-Motor or cab service meets every train at Lower Beaconsfield. 4 Jul 1949, FORMER STATE BANK CHIEF DIES. MR WILLIAM WARREN KERR, CMG, CBE, of Belmont av, Kew, a former chairman of the State Savings Bank of Victoria, and a leading insurance broker, died at his home on Saturday, aged 84. Born at Kilmore and educated at Melbourne Grammar School, Mr Kerr established an Insurance broking business in 1913. He became president of the Melbourne Chamber of Commerce in 1916, and two years later was appointed president of the Associated Chambers of Commerce of Australia. During World War I he was chairman of the Commonwealth War Savings Council and the Victorian War Savings Committee, and was elected a commissioner of the State Savings Bank. At the same time the Commonwealth Government nominated Mr Kerr as chairman of the Royal Commission on taxation. It was he who was mainly responsible for amalgamation of State and Federal taxation systems. Throughout his public life Mr Kerr was prominent in charity work, and was particularly interested in the Boy Scout and Toc H movements. He was a council member of the Swinburne Technical College, a trustee of the Collins st Independent Church, and chairman of the Congregational Union in Victoria from 1905-6. He had occupied several high offices in Freemasonry, and was a former Mayor of Kew. He has left a daughter, Mrs V. P. Odgers, of Kew, and a son. 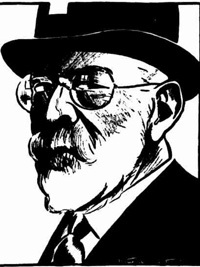 Mr L. G. Kerr, of Croydon. 23 Jul 1949, A memorial service to the late Mr William Warren Kerr will be held in Collins st Independent Church at 3pm tomorrow. Speakers will include Judge Book, Sir Clifden Eager, President of the Legislative Council, Mr Norman Williams, general manager of the State Savings Bank, the Rev Gordon Powell, and the Rev Walter Albiston. [S1] Registry of Births Deaths and Marriages Pioneer Index Victoria 1836-1888 "#B2964 [par John Wilson KERR & Ellen GARDINER]." [S1] Registry of Births Deaths and Marriages Pioneer Index Victoria 1836-1888 "#M3322." [S11] Newspaper - Argus 19 Apr 1887 p1. [S185] Property Titles. ; PROV (Public Records Office Victoria), C/T 2140-895 - William Warren Kerr of William Stret Melbourne Insurance Broker. [S185] Property Titles. ; PROV (Public Records Office Victoria), C/T 4181-043 - Lindsay Gardner Kerr of Upper Beaconsfield Orchardist. [S185] Property Titles. ; PROV (Public Records Office Victoria), C/T 4181-043 - William Warren Kerr of 32 Belmont Avenue Kew Insurance Broker. [S11] Newspaper - Argus 4 Jul 1949 p9. [S185] Property Titles. ; PROV (Public Records Office Victoria), C/T 2140-895 - William Warren Kerr died on 2nd July 1949. Probate of his will has been granted to Violet Jean Gosman Odgers of Trenant 32 Belmont Avenue Kew Widow. [S12] Newspaper - South Bourke and Mornington Journal 9 Aug 1905, p2. [S11] Newspaper - Argus 7 Mar 1914, p13. [S11] Newspaper - Argus 12 Oct 1922 p2. [S11] Newspaper - Argus 17 Mar 1932 p6. [S11] Newspaper - Argus 1 Jun 1932 p5. [S11] Newspaper - Argus 16 Dec 1937 p4. [S14] Newspaper - Sydney Morning Herald. 4 Jul 1949, p1. [S11] Newspaper - Argus 4 Jul 1949 p6. [S11] Newspaper - Argus 23 Jul 1949 p13. 10 Jul 1906, AUSTRALIAN WOMEN'S NATIONAL LEAGUE. MEETINGS OF BRANCHES. UPPER BEACONSFIFLD. [S1] Registry of Births Deaths and Marriages Pioneer Index Victoria 1836-1888 "#B13469 [par Alexander GOSMAN & Jane BUCHANAN]." [S80] Ancestry - Family Tree, BALFOUR Family - Owner: jgrant169. [S185] Property Titles. ; PROV (Public Records Office Victoria), C/T 1837-239 - Janie Buchanan Kerr of Wrexon Street Kew Married Woman - C/T 2967-228. [S185] Property Titles. ; PROV (Public Records Office Victoria), C/T 2967-228 - Mortgage No 224251 - Frank Ernest Williams and Annie Marina Williams - discharged 7 Dec 1920. [S11] Newspaper - Argus 28 Jul 1945 p2. [S11] Newspaper - Argus 10 Jul 1906, p6. William Buchanan Kerr was 21 when he enlisted on 23 Sep 1914. He was working as an insurance broker. His unit embarked from Melbourne on 22 Dec 1914 on board Troopship A40 Ceramic. He was a Lieutenant with the 16th Battalion, and saw service in Egypt and Gallipoli before he was killed in action on 2 May 1915. Note* 1919 Fragment of officer's tunic collar : 16 Battalion, AIF, Bloody Angle, Gallipoli Remains of a proper right side Australian officer's tunic collar. Attached to it are a Rising Sun badge and three other badges to its right, reading '16 / INF'. Each badge has two lugs held in place, with the exception of the numeral '1', by split pins. The open edge of the collar bears a brass hook which would have fastened into a corresponding eyelet on the other side of the collar. Summary: This piece of tunic collar was found on 10 January 1919 by Lieutenant William Hopkin James, who was working on Gallipoli, leading a small party from the Australian War Records Section, taking photographs and collecting items for the national collection. James found fragments of uniforms and bones in a gully between Quinn's Post and Dead Man's Ridge, leading up to the Bloody Angle. They were the remains of members of the 16th Battalion (Bn), who had attempted to extend the Australian line, to the left of Quinn's Post from 2 to 3 May 1915. The 16th Bn landed at Gallipoli in the evening of 25 April 1915. Much of the battalion occupied the position that became known as Pope's Hill. They remained there until the evening of 30 April, when they were relieved by the 15th Bn and went to Rest Gully, where they spent time digging in to protect themselves from Turkish snipers. On 2 May the battalion was ordered to the front line, to the left of Quinn's Post, where they were to advance to a position that was later called the Bloody Angle. The 13th Bn was to extend its line to the left, joining with the New Zealand Otago Bn, who were to attack Baby 700. The 15th Bn were to take part from Pope's Hill. The attack took place in the evening of 2 May. After the bombardment of the Turkish positions ceased, the 16th Bn made their way up the steep side of the valley, towards the Bloody Angle. The Turks held their fire until the battalion reached the top of the ridge, then directed heavy fire opened on it, mostly from their positions at The Nek and the Chessboard. The battalion fought and dug in throughout the night, extending the trench line from Quinn's Post. Some of their men found an abandoned Turkish trench on the crest of the Bloody Angle and occupied it. During the attack the Otago Bn failed to reach their objective at Baby 700 and were forced to dig in near The Nek. The 13th Bn positioned themselves on the other side of the gully, to the left of the 16th Bn, but each battalion was uncertain of each other's location and could not join up. At dawn on 3 May, the New Zealanders withdrew under heavy fire and the Turks occupied their line. The Turks in front of the 16th Bn attacked, but were driven back. The 16th Bn then attempted to attack a Turkish position, from which heavy rifle fire was coming, but the Turks were alerted to the attack and their machine gun fire from Baby 700 raked the line. In addition, nearby Turks threw bombs and expended heavy fire on the men of the 16th Bn. The dead lay thickly between their respective positions. As the sky lightened, the Turks crept through the scrub towards the 16th Bn and inflicted further heavy casualties. Although attempts were made to reinforce the 16th Bn, the Turkish fire made it impossible to reach them. The battalion gradually withdrew through the day, and the Turks took over their trench line. Having lost support from both their left and right flanks, the 13th Bn then withdrew during the night. The 16th Bn suffered very high casualties at the Bloody Angle. Entering the action with 17 officers and 620 men, they lost eight officers and 330 men. The battalion's dead remained unburied until after the war, when their remains were recovered by the Graves Registration Unit and buried in the newly established Quinn's Post cemetery nearby. 22 May 1915, LIEUTENANT W. B. KERR. 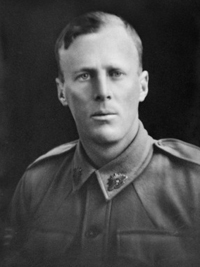 William Kerr was born on 23 May 1893 in Kew, Victoria. His parents were William Warren and Jane Buchanan (née Gosman) Kerr. He attended Scotch in 1908. William was an insurance broker and commercial traveller when he enlisted on 23 September 1914 at Adelaide, South Australia. He served in the 16th Battalion with the rank of Lieutenant. William died on 2 May 1915 at Gallipoli. He was 21 years of age. 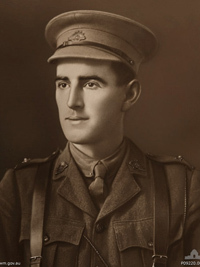 William Kerr had served in Citizen Military Forces battalions for two years before the war, and was made a 2nd Lieutenant when he joined the AIF in South Australia in September 1914. He landed with the 16th Battalion at Gallipoli on the afternoon of 25 April 1915. He had been promoted to full Lieutenant when he participated in the battalion’s costly attack on the Bloody Angle the following week and was killed. His service file contains a poignant letter from Kerr’s father, asking for accurate details of his son’s death. William Kerr has no known grave, but is commemorated at Lone Pine Memorial, Gallipoli. [S2] Registry of Births Deaths and Marriages Federation Index Victoria 1889-1901 "#B23763." [S11] Newspaper - Argus 17 Jun 1893 p1. [S11] Newspaper - Argus 22 May 1915 p13. Description: Studio portrait of Lieutenant (Lt) William Buchanan Kerr, 16th Battalion who was a 21 year old insurance broker from Adelaide, South Australia when he enlisted on 23 September 1914. He embarked for overseas from Melbourne on 22 December 1914 aboard HMAT Ceramic. Following training in Egypt, the 16th Battalion landed at Gallipoli in the late afternoon of 25 April 1915. A week later, they were thrown into the attack on Bloody Angle, suffering many casualties. Lt Kerr was killed in action on 2 May 1915 and his name is listed on the Lone Pine Memorial for those who have no known grave. One of 131 photographs displayed on an honour board showing members of the Adelaide Rowing Club who enlisted for active service in the First World War. The original is held by the Adelaide Rowing Club who kindly loaned the board to the Australian War Memorial for copying. Description: Studio portrait of 2nd Lieutenant (2nd Lt) William Buchanan Kerr, 16th Battalion, of Adelaide, SA. An insurance broker prior to enlisting in September 1914, 2nd Lt Kerr embarked from Melbourne on board HMAT Ceramic (A40) on 22 December 1914. He was killed in action at Gallipoli on 2 May 1915. 2nd Lt Kerr was 21 years of age." [S14] Newspaper - Chronicle (Adelaide), 22 May 1915, p44. [S14] Newspaper - Observer (Adelaide), 22 May 1915, p39-40. Cyril Godfrey Marsh enlisted on 18 Sep 1914 when he was 21 years old and a clerk. He had been with the 29th Light Horse before the war, and was a Squadron Sergeant Major. SERN 187. He was a commissioned Lieutenant with the 8th Light Horse Regiment, B Squadron when he embarked from Melbourne on 25 Feb 1915 on board HMAT A16 Star of Victoria. He saw service in Egypt and at Gallipoli. He was killed in action at Lone Pine on 7 Aug 1915. Death-Notice* 21 Aug 1915 MARSH.—Killed in action, 7th August, at the Dardanelles, Lieutenant C. G. Marsh, dearly beloved youngest surviving son of John G. and Clara Marsh, Beaconsfield Upper, aged 22 years. 2 Feb 1907, Beaconsfield Upper. Dear Cinderella, — This is the first time I have written to you. We have a big orchard up here and so I have plenty to keep me employed. The country around here is very mountainous & our house is situated on a very high hill which overlooks the sea (20 miles away) and consequently we have a lovely & extensive view. We have two kittens, both tabbys. Can you tell me names for them please. I think I am going to Sydney for my Christmas holidays & I think it will be very nice. I have to walk three miles to school every day & it makes me pretty hot in the summer time. Well Cinderella I have nothing more to say & so I must close with love. I remain your new friend, CYRIL G. MARSH. 13 years. [S2] Registry of Births Deaths and Marriages Federation Index Victoria 1889-1901 "B14945." [S11] Newspaper - Argus 13 May 1893 p1. [S16] Newspaper - The Age 21 Aug 1915, p5 nearly identical notice. [S14] Newspaper - Leader (Melbourne, Vic. : 1862 - 1918), Sat 2 Feb 1907, p42. [S12] Newspaper - South Bourke and Mornington Journal 26 Aug 1915, p2. [S19] Newspaper - Berwick Shire News and Pakenham and Cranbourne Gazette "1 Sep 1915, p3." [S11] Newspaper - Argus 9 Sep 1915, p10. [S14] Newspaper - Mornington Standard (Frankston) 18 Sep 1915, p2. 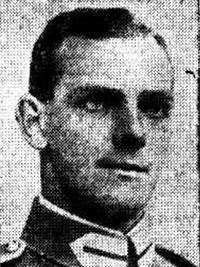 photograph published in The Age on 25 Oct 1915, p13. 15 Dec 1893, PUBLIC NOTICE. MR. J. G. MARSH, In thanking the Residents of Box Hill and Surrounding Districts for the support so liberally bestowed upon him in the past, has much pleasure in announcing that he has secured the services of Mr. A. LEGG to Manage his Box Hill Chemistry Business, a gentleman well qualified in every particular to fill so important a position. Customers may, therefore, rely upon having the best experience obtainable, with civility and attention, combined with the purest of drugs obtainable at town prices Mr. Marsh trusts for a continuance of past favors. On the Upper Beaconsfield ranges, at a height of 900ft. above sea level, Mr J. G. Marsh has established an excellent orchard. Over an area of 18 acres most attention is paid to apples, which appear to be better suited for the soil and climate than anything else. Williams' Bon Chretien pear trees have given satisfaction. Mr Marsh acquired the property he has so effectively im proved nearly 20 years ago. It consisted of 60 acres of rough bush land, on which nothing in the shape of clearing or cultivation was attempted. A house and boundary fences had been erected. Being within 30 miles of Melbourne, and on an eminence commanding views of special interest, the situation represented an asset of considerable value. From the front door of Mr Marsh's residence a wide tract of country can be scanned. In the foreground to the east, south and west, a vast extent of rural Victoria comes within vision. Prominent in the scene are the rich reclaimed areas of the extensive Koo-Wee-Rup swamp and other important districts of Eastern and South ern Victoria. At all points there are evidences of prosperous set tlement as indicated by well tilled fields, farm animals of every descripion, comfortable homesteads, towns and villages here and there, with railway lines intersecting at various places. These converge as they approach Melbourne, which is dimly visible through a smoky haze to the west. In the background of this interesting panorama the outlines of Hobson's Bay, Port Phillip Bay, and Western port Bay can be traversed with the naked eye. Amid these surroundings Mr Marsh has created a very fine orchard. It is a model one in many respects, and the influence of the work already done cannot fail to be felt throughout the district. When Mr Marsh became possessed of the rangy land at Upper Beaconsfield in 1897, he knew practically nothing about fruit trees. At that time he was practising his profession as a pharmaceutical chemist in Melbourne. With a view to converting the 60 acre block into a permanent home, orcharding was decided on. The initial work of clearing scrub and timber involved an expenditure of something like £6 an acre. At that stage Mr Marsh took a hand in planting the trees. Weekends and all available spare time were spent in the prospective orchard. A site with gentle rises on either side, and a valley in the centre was selected. The wisdom of this decision has been demonstrated by an even distribution of sunshine over the whole of the cultivated area and the facilities for in stalling effective drainage. Nearly four miles of two and three inch agricultural pipes are under the trees at varying grades to suit the conditions of contour. The average depth is about three feet. Although this work cost approximately £800, Mr Marsh regards it as money well spent. Before drainage was complete, the soil retained so much moisture that walking over parts was difficult. No amount of rain now causes inconvenience, for the reason that the surplus has a free outlet. This was one of the first operations that Mr Marsh initiated and carried out. He has since managed the orchard with unqualified success. In Mr Marsh's opinion, more failures with fruit trees are caused by imperfectly drained land than anything else. He was not long in coming to the conclusion that fruit trees are constituted much on the same lines as animals. The physical condition of each revolts at excesses, and the retention of more moisture in the soil than is desirable has a bad effect. If there is one matter on which Mr. Marsh is more insistent than another, It is that of permitting trees to be come fully matured before they are allowed to bear. He considers it is courting failure to encourage the fruit ing of trees at the early age of three and four years, as is frequently the case. Strong as the desire for returns may be, it should be suppressed so that the trees may become sufficiently robust to stand the demands which bearing entails. The longer they can he kept back the better. Generally speaking, the seventh year is soon enough for apple and pear trees to carry a full crop. Following his own ideas in this regard, Mr. Marsh pre vented the trees from bearing until the tenth year. During that period atten tion was devoted to producing a suit able frame. The appearance of the trees indicates that Mr. Marsh's con clusion is sound. Few, of course, can afford to wait 10 years for returns. There, is, however, much in the con clusion that the forcing of young trees into bearing accounts for many of the diseases and maladies complained of. It is doubtful whether a more uniform collection of trees than is to be seen in Mr Marsh's orchard exists in Australia. There is similarity through out in size and shape. The centres are properly open, and the main branches radiate from the trunks in such a way that each cannot fail to receive an equal amount of sustenance. Mr. Marsh takes care that the trees do not carry more fruit than they can support. The varieties of apples in cultivation are seven acres of Jonathans, two acres of Home Beauties, two acres of Gravensteins, three acres of Yates, two acres of Reinette du Canadas, one acre of Wil liams' Bon Chretien pears, and one acre of mixed fruits for household purposes. After careful consideration, Mr. Marsh has come to the conclusion that growers in the ranges would do well to confine attention to the cultivation of Jonathan and Yates varieties. Crinkle and its kindred malady, bitter pit, are believed to be due to the use of unsuitable stocks. Mr. Marsh intends to test his belief in this important phase of apple production. Since he retired from business about nine years ago, Mr Marsh and his son found no difficulty in doing all the work involved in maintaining an 18- acre orchard in good condition. This included ploughing, pruning, spraying, and summer cultivation. In the pick ing season additional hands had to be engaged. Mr Marsh's son, with the rank of lieutenant in the 8th Light Horse, fell at Gallipoli in the Lonesome Pine action. For several years, how ever, Mr Marsh and his son systema tised the work in such a manner that they were never overburdened. Indeed there is nothing out of place in the orchard, or on any part of the property. There are evidences of thrift on every side. Mr Marsh favors the lateral method of pruning rather than the en couragement of short spurs. He states that the soil is not sufficiently rich to furnish full bearing trees with ne cessary nourishment, and applies superphosphate at the rate of one pound to each tree. Ni trate of soda is used when certain trees demand extra nourish ment. Mr Marsh does not approve of the practice frequently observed of al lowing windfall apples to remain on the ground so that they may rot or be ploughed in. Apples, he points out, contain large proportions of acid, and there is a danger of adding more of that ingredient than is necessary. There is not much to be feared from the few that fall in ordinary seasons. In a fruiting period such as the one just closed, when tons of fruit are on the ground, the menace of adding too much acidity needs to be minimised by removing the waste from the orchard. An examination of discharges from the drain pipes in winter showed Mr Marsh that much of the chemical fertilisers was carried off in solution, instead of serving the manurial purpose intended. A chemical analysis revealed nearly 50 per cent, in a given quantity of drainage water. The result would appear to indicate that it is not advisable to apply artiticial fertilisers until the rainy season has passed, and there is no fear of displacement in the manner mentioned. August and September are, therefore, more suitable months than June and July for the distribution and incorporation with the soil of manurial mixtures. Green manuring is favored. In the control of pests Mr Marsh has been successful. Having a knowledge of chemistry, he is able to manufacture arsenate of lead, lime sulphur, and other mixtures that have to be directed against insects and fungi. Codlin moths and all kinds of insects that bite and chew their food cause little trouble when the trees are carefully sprayed at the right time in spring with arsenate of lead. In the suppression of fungus diseases lime-sulphur is considered more effective than Bordeaux mixture. For winter spraying Mr Marsh uses the lime-sulphur solution at a strength of eight pounds of lime, eight pounds of sulphur, and 50 gallons of water. In spring and summer, when the trees are in leaf, four pounds of lime, four pounds of sulphur, dissolved in 50 gal lons of water, make a sufficiently strong mixture. For Jonathan and Graven stein trees both solutions should be a little weaker. The foliage of those varie ties is more delicate than that of Five Crowns, Rome Beauty's, Yates, Reinettes and other sorts. Red oil applied in win ter, when the trees are dormant, at a strength of one in 20, has been found the most effective spray to subdue woolly aphis and scale insects. With the sprays mentioned Mr Marsh claims that he can keep his orchard clean. The condition of the trees and the fruit recently removed from the latest varie ties bear out the contention. Black spot affects Yates apples worse than any of the other kinds, and Mr Marsh has found it necessary to treat them with Bordeaux mixture in lieu of lime sulphur as the season advances and close and muggy weather comes at the end of summer. The one pest for which no effective remedy or method of con trol has yet been discovered is thrip. Last year these insects made a clean sweep of apple crops in the Upper Beaconsfield district. They appeared to come out of the ground at the beginning of spring, and played such havoc that yields were the lowest on record. Some of the orchards were completely devas tated. Mr Marsh's sales amounted to £11 as against an expenditure of £200, which is the normal annual cost of maintaining and working the orchard. Having struck out with success in matters associated with the manage ment of fruit trees, Mr Marsh decided to adopt progressive methods in the marketing of his fruit. He regulates the crop so that each tree shall carry no more than it can satisfactorily mature. This season the complaint was general that Jonathans and Yates apples were undersized. In consequence of that large quantities had to be sold at reduced rates. Thousands of cases were not gathered because of the un profitable prices offering. Mr Marsh found no difficulty in disposing of all the fruit he had for sale at an average of 3/9 a bushel. Those returns were being received when complaints were common that fruit was not realising the freight charges in many instances. Mr Marsh says he could have gathered nearly 8000 cases of apples had he per mitted the trees to carry all that formed. He preferred to have half that yield with corresponding improvements in size, shape, and quality of fruit. This important matter is one that can be controlled, and until orchardists pay attention to it on the lines adopted by Mr Marsh there will always be com plaints in plentiful seasons. Packing and grading are systematised by Mr Marsh. He believes in making the fruit and the packages containing it as at tractive as possible. From that stand point hard wood cases are regarded as objectionable. The neat soft-wood boards are planed and put together properly. A legible stencil marking at one end of the case indicates the size and variety of fruit, and the district in which it was grown. [S5] Registry of Births Deaths and Marriages Death Index Victoria 1921-1985 "#D8813 age 80 [par John Hale MARSH & Emma GARRETT]." [S2] Registry of Births Deaths and Marriages Federation Index Victoria 1889-1901 "#M7142." [S185] Property Titles. ; PROV (Public Records Office Victoria), C/T 2339-725 + C/T 2343-505 + C/T 2638-403 - John Garrett Marsh of 138 Clarendon Street South Melbourne Chemist. [S185] Property Titles. ; PROV (Public Records Office Victoria), C/T 1812-349 - John Garrett Marsh of Beaconsfield Upper Storekeeper. [S185] Property Titles. ; PROV (Public Records Office Victoria), C/T 1812-349 - Silvanus Best of Beaconsfield Upper Storekeeper - C/T 3032-369. [S5] Registry of Births Deaths and Marriages Death Index Victoria 1921-1985 "#D4951 [par Charles John MARSHMAN & Maria MOXHAM]." [S185] Property Titles. ; PROV (Public Records Office Victoria), C/T 2339-725 + C/T 2343-505 + C/T 2638-403 - His Majesty King George V.
[S5] Registry of Births Deaths and Marriages Death Index Victoria 1921-1985 "#D8028/1961." [S11] Newspaper - Argus 2 Sep 1940 p4. [S35] Probate Records, PROV (Public Records Office Victoria), VPRS 28/P3, unit 3413; VPRS 7591/P2, unit 1117. [S14] Newspaper - Reporter (Box Hill), 15 Dec 1893, p3. [S12] Newspaper - South Bourke and Mornington Journal 22 Feb 1905, p2. [S14] Newspaper - Weekly Times, 10 Jun 1916, p48. [S11] Newspaper - Argus 23 Dec 1925, p20. Roy John Tyler was a married farmer living at Kilmany South when he enlisted on 22 Jun 1916. SERN 6904. His unit embarked from Melbourne on board HMAT A11 Ascanius on 11 May 1917, shortly after the birth of his daughter. He was made a temporary sergeant with the 22nd Battalion. He was killed in action on 9 June 1918 at Morlancourt, France. He was buried at Mericourt L'Abbe Communal Cemetery Extension (Plot III, Row C, Grave No. I), France. "I should like to tell you how touched I was to see the row of crosses which had been placed in front of the war memorial at Upper Beaconsfield for Anzac Day. One of them bore the name of my father, Sgt. Roy John Tyler, who was killed in France in 1918. It is good to know that he is still remembered and honoured by the people of Upper Beaconsfield. A friend of mine happened to see the crosses on Anzac Day and kindly drove me to Upper Beaconsfield the following day especially to see them. 9 Jun 1921, TYLER. - Killed in action 9th June, 1918, at Morlancourt, France, Sgt. Roy J. Tyler, 22nd Batt., the dearly loved husband of Daisy Tyler, 24 Vincent street, E. Malvern. [S1] Registry of Births Deaths and Marriages Pioneer Index Victoria 1836-1888 "#B22274." [S11] Newspaper - Argus 1 Jul 1918 p1. [S35] Probate Records, PROV (Public Records Office Victoria), 171/729 of Kilmany South, farmer. [S15] Newspaper - Village Bell "Issue 012-1980 p14 RSL Article from Paul Easton." [S114] Electoral Roll for Australia, 1914 "Roy's address as Kilmany Settlement." [S14] Newspaper - Table Talk, 2 Mar 1911, p8. [S14] Newspaper - Australasian, 4 Mar 1911, p48. [S14] Newspaper - Gippsland Times, 29 Dec 1913, p3. [S11] Newspaper - Argus 2 Jan 1914 p8. [S19] Newspaper - Berwick Shire News and Pakenham and Cranbourne Gazette "7 Jan 1914, p3." Gippsland Times, 8 Jul 1918, p3. [S11] Newspaper - Argus 9 Jun 1919 p1. [S11] Newspaper - Argus 9 Jun 1921 p1. [S35] Probate Records, PROV (Public Records Office Victoria), VPRS 28/P5, unit 865; VPRS 7591/P4, unit 144. [S11] Newspaper - Argus 9 Apr 1946, p2. [S14] Newspaper - Illustrated Australian News for Home Readers (Melbourne), 17 Jul 1869, p150. [S1] Registry of Births Deaths and Marriages Pioneer Index Victoria 1836-1888 "#M3001." Victoria street west is the address of William Eckersall at his death in August 1890. [S14] Newspaper - North Melbourne Advertiser (Vic), 8 Jun 1883, p2. [S185] Property Titles. ; PROV (Public Records Office Victoria), C/T 2579-657 - Egbert Charles Tyler and John Tyler - see C/T 2643-578 - Egbert Charles Tyler of Park Hotel Fremantle Western Australia Engine Driver and John Tyler of Louisa Street Coburg as tenants in common. [S185] Property Titles. ; PROV (Public Records Office Victoria), C/T 2643-578 - see C/T 2666-085 - Egbert Charles Tyler of Gembrook Engine Driver. [S185] Property Titles. ; PROV (Public Records Office Victoria), C/T 2580-876 - John Tyler "Copenhagen" Upper Beaconsfield Orchardist, he must have paid out the mortgage to Ruddock. (four mortgages registered on this property on C/T 2580-876) 1) 28 Jul 1902 to Frederick Thomas Hickford discharged 9 May 1903 ; 2) 9 May 1903 to Annie Georgina Powell discharged 22 Feb 1906 ; 3) 24 Feb 1906 to Arthur Norman McArthur [a local land holder] discharged 27 Jun 1913 ; 4) 9 Dec 1907 to George Ernest Mather [a local land holder] discharged 2 Apr 1909. [S185] Property Titles. ; PROV (Public Records Office Victoria), C/T 2666-085 - Egbert Charles Tyler to Egbert Charles Tyler and John Tyler (two mortgages registered on this property on C/T 2666-085) 1) 27 Oct 1897 to Martha Isabella Grisold discharged 17 Aug 1899 ; 2) 17 Aug 1899 to John Sutcliffe and George Williams - there is no mention of this mortgage being discharged. - see 2773-546 John Tyler of Upper Beaconsfield Farmer and Egbert Charles Tyler of Hawke Street West Melbourne Engineer (four mortgages registered on this property on C/T 2773-546) 1) 28 Jul 1902 to Frederick Thomas Hickford discharged 9 May 1903 ; 2) 9 May 1903 to Annie Georgina Powell discharged 22 Feb 1906 ; 3) 24 Feb 1906 to Arthur Norman McArthur [a local land holder] discharged 27 Jun 1913 ; 4) 9 Dec 1907 to George Ernest Mather [a local land holder] discharged 2 Apr 1909. [S185] Property Titles. ; PROV (Public Records Office Victoria), C/T 1565-907. [S185] Property Titles. ; PROV (Public Records Office Victoria), 3263-560 this area is the land reserved for the North Beaconsfield School. [S4] Registry of Births Deaths and Marriages Great War Index Victoria 1914-1920 "#D7753 age 75 [par Liberty TYLER & Sarah MORRIS]." [S14] Newspaper - Gippsland Times, 27 May 1920, p3. [S11] Newspaper - Argus 31 May 1920, p1. [S35] Probate Records, PROV (Public Records Office Victoria), 172/552. [S12] Newspaper - South Bourke and Mornington Journal 23 Oct 1901, p3. [S11] Newspaper - Argus 5 May 1914 p1. [S1] Registry of Births Deaths and Marriages Pioneer Index Victoria 1836-1888 "#B15794." [S35] Probate Records, PROV (Public Records Office Victoria), VPRS 28/P5, unit 1144; VPRS 7591/P4, unit 199. [S1] Registry of Births Deaths and Marriages Pioneer Index Victoria 1836-1888 "#B27246." [S1] Registry of Births Deaths and Marriages Pioneer Index Victoria 1836-1888 "#M3331." [S38] Index of burials in the cemetery of Warrnambool Cemetery,. Death-Notice* 13 Apr 1943 TYLER.—March 12. 1943, at a private hospital, Egbert Charles, beloved husband of Hazel Tyler, of Abbotsford, and loved father of John Egbert Tyler, aged 67 years. TYLER.—The Funeral of the late Egbert Charles Tyler, late manager of Nestles Chocolate Factory, Abbotsford, will leave our Chapel, 32 Railway Parade, Burwood, this Saturday after service commencing at 2.30 p.m., for Northern Suburbs Crematorium. [S1] Registry of Births Deaths and Marriages Pioneer Index Victoria 1836-1888 "#B20179." [S185] Property Titles. ; PROV (Public Records Office Victoria), C/T 2638-568. [S185] Property Titles. ; PROV (Public Records Office Victoria), C/T 1625-865 - John Beale - discharged 5 Feb 1901 - Mortgage No 187939. [S185] Property Titles. ; PROV (Public Records Office Victoria), C/T 2638-568 - John Sutcliffe and George Williams - discharged 9 May 1903 - Mortgage No 192965. [S185] Property Titles. ; PROV (Public Records Office Victoria), C/T 1625-865 + C/T 2638-568 - Frederick Thomas Hickford - discharged 9 May 1903 - Mortgage No 212529. [S185] Property Titles. ; PROV (Public Records Office Victoria), C/T 1625-865 + C/T 2638-568 - Annie Georgina Powell - discharged 22 Feb 1906 - Mortgage No 219372. [S185] Property Titles. ; PROV (Public Records Office Victoria), C/T 1625-865 + C/T 2638-568 - Alfred James Roberts, Edward Herbert Smith and William Phillip Roberts - discharged 22 Jul 1920 - Mortgage No 331014. [S185] Property Titles. ; PROV (Public Records Office Victoria), C/T 2638-568 - see C/T 4848-408 - Thomas John Crook of Commercial Road South Yarra Merchant. A Caveat No 46640 was lodged 16 May 1916 - lapsed 29 May 1924. [S185] Property Titles. ; PROV (Public Records Office Victoria), C/T 1625-865 - see C/T 4848-408 - Thomas John Crook of Commercial Road South Yarra Merchant. A Caveat No 46640 was lodged 16 May 1916 - lapsed 29 May 1924. [S7] Registry of NSW Births Deaths and Marriages "#D6647 NSW [reg. Woollahra]." [S14] Newspaper - Sydney Morning Herald: 13 Apr 1943 p16. [S1] Registry of Births Deaths and Marriages Pioneer Index Victoria 1836-1888 "#B26292." [S5] Registry of Births Deaths and Marriages Death Index Victoria 1921-1985 "#D10543 age 74 -- as McNABB." [S1] Registry of Births Deaths and Marriages Pioneer Index Victoria 1836-1888 "#B6261." [S5] Registry of Births Deaths and Marriages Death Index Victoria 1921-1985 "#D6359 age 60 -- as BRYANT."